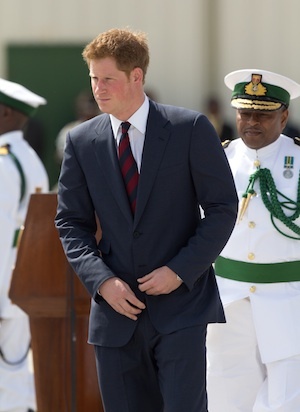 Prince Harry spent the last week traveling through the Bahamas and South America in honor of The Queen’s Diamond Jubilee tour. On Tuesday, the Prince of Wales joked around with a track phenomenon and had lunch with Prime Minister Portia Simpson Miller. In what seemed to be a very busy schedule, Prince Harry spent Tuesday in Kingston, Jamaica as part of a royal tour through the Bahamas and South America. The Prince of Wales met with iconic Jamaican figures and seemed at-ease in tropical paradise. His trip included a chance to beat the fastest man in the world, Usain Bolt. The two met up on a track and while Prince Harry came away victorious, he was granted a 50-meter head start while Bolt lightly jogged behind. At the end of the race, Prince Harry stuck a triumphant pose at the finish line while Bolt playfully laughed. Usain is a 25-year-old track superstar — also known as “Lightning Bolt” — who holds a slew of gold medals and world records. The visit was not all fun and games, though. Jamaica’s Prime Minister, Portia Simpson Miller, requested full independence from England just two months ago. “We will initiate the process of our detachment from the monarchy” she stated in January to the BBC. However, CBS News reports there seemed to be no overt signs of ill-feelings or awkwardness when Prince Harry and Prime Minister Simpson Miller met for lunch on Tuesday. The two smiled and embraced in a public hug. Prince Harry’s trip to Jamaica is part of his grandmother’s Diamond Jubilee tour which celebrates 60 years of The Queen of England’s reign. The entire Royal Family is scheduled to make several “regional and overseas” trips to nations that were once British colonies but now share just a formal allegiance to the Crown.